Steven (Chicagoland, United States) on 15 April 2019 in Plant & Nature and Portfolio. 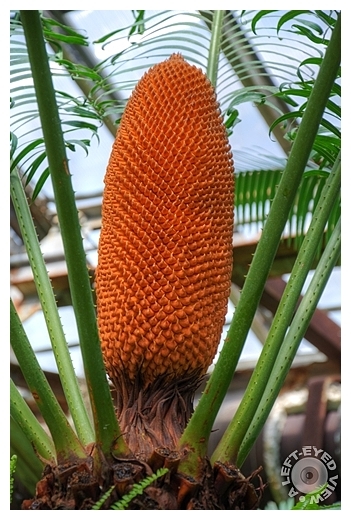 Cycads have a cylindrical trunk which usually does not branch. Leaves grow directly from the trunk, and typically fall when older, leaving a crown of leaves at the top. The leaves grow in a rosette form, with new foliage emerging from the top and center of the crown. The trunk may be buried, so the leaves appear to be emerging from the ground, so the plant appears to be a basal rosette. The leaves are generally large in proportion to the trunk size, and sometimes even larger than the trunk. Spotted here is the male strobilus. Photo captured April 27, 2012. Very impressive. I have never seen this plant. Impressive nature, the color, the size and shape is amazing! A very interesting plant . Excellent color and detail. Wow. What a stunning piece of nature. I like the contrast in color. You have captured the details beautifully. Wow, a beautiful and interesting plant! Wow... jamais vu de pareil... Excellente prise. Great picture with the details and color. Magnifique plante. C'est la première fois que j'en vois une. What an interesting plant. I have never seen one like this. An amazing trunk! What an unusual plant. Interesting info. Well isn't that unusual! What a lovely color! For me, seeing a photo of this flower(?) is a debut. Excellent contrast and color vibration level.